Poker players will be happy to know that gambling is allowed in Louisiana so long as it's in a casino or on a riverboat. Home poker games are ok too, if players follow the rules. However, online poker is questionable, as is the likelihood of Louisiana regulating real money games in the future. But there is no question to how they feel about businesses trying to provide unregulated gaming. Read on to learn what that is. Louisiana is one of the few states to prohibit online gambling. So it appears that the concern is more or less about the operator of a gambling site, or anyone helping them run it. But not so much the player. That said, given that many reputable US poker sites prohibit players from Louisiana from signing up, I would assume that it's not very clear as to whether or not it's ok for residents to play online. I would encourage you to consult with a lawyer or your local authorities before partaking in online poker or casino games. Playing poker in a home game appears to be ok so long as no one takes a profit, fee or rake from the game itself, but only from the other players. Louisiana is very stern about gambling in public or operating what appears to be a gambling business. In these statutes "gambling" seems to apply to conducting or directly assisting in a business, but not playing. Since "business" tends to mean turning a profit, one could assume that home games should be ok.
Do Casinos in Louisiana Offer Poker? Gambling is a pastime in Louisiana. You'll find all kinds of games in land and river based casinos, including blackjack, slots, roulette, craps and 3-card poker. You'll find plenty of poker games, too. Popular casinos include the Paragon Casino & Resort and the Amelia Belle. We receive a lot of questions about state poker laws and the gambling laws in Louisiana. We thought we'd post those here for everyone to benefit from. Will online poker be regulated in Louisiana? This is hit or miss. Given their stance on online gambling, one might say no way. However, online gambling is a state pastime, and assuming they could be assured that online gaming will be safe and legit (on a federal level), we couldn't see Louisiana turning down the additional revenue. Here is a timeline of the events in Louisiana regarding the regulation of online gambling. You'll notice that Louisiana hasn't done a whole lot. But as things happen we'll post them here. A plan was proposed to "study the feasibility and practicality of authorizing internet gaming in Louisiana and to report the findings" before 2014. Is there an online poker room that accepts players from Louisiana? 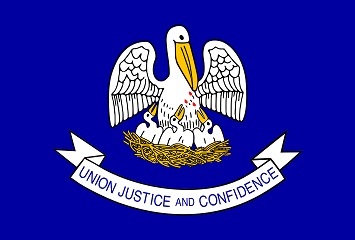 Louisiana is one of those states that is prohibited from the majority of online poker sites that still accept US customers. However, you can still sign-up to sites like BetOnline or Sportsbook Poker. What other forms of regulated gambling is offered in Louisiana? In addition to the land based and riverboat casinos, the state also had horse racing, charity bingo, raffles and a state lottery. Where can I read more about Louisiana poker laws? Here are some interesting facts about gambling and poker in Louisiana state. People that "maintain themselves by gambling" are guilty of vagrancy under the laws in Louisiana. Casino machines must pay out between 80-99 percent of the total wagers. It has been said that poker originated in Louisiana in the year of 1829, using 20 cards and 4 players betting on which hand was the most valuable. It later spread from there to riverboats on the Mississippi river.